For those of you searching for where to purchase the Samsung Galaxy Tab 8.9″ tablet, you should know that the ideal size for a tablet is still in debate and until the verdict has been set, which is probably never, companies will continue to speculate what the right size is. Currently, the vast majority of tablets are between 9 and 10 inches with very few going beyond that size. The Galaxy Tab 8.9” as the name suggests is an 8.9-inch tablet which comes snugly between the Galaxy Tab 7 and Galaxy Tab 10. Samsung hopes that this tablet will better allow it to compete with the iPad which still remains the top selling tablet on the market. So what is the Tab 8.9 packing that makes it g Below you’ll learn why this savvy tablet is earning a 5 out of 5 stars from users, and why everyone wants to know where to buy the Samsung Galaxy Tab 8.9″. Depending on the version of the Tab 8.9 that you get, 3G or WiFi only will be an option. Samsung is including GSM 850/900/1800/1900 on the 2G/3G model along with WiFi 802.11n. 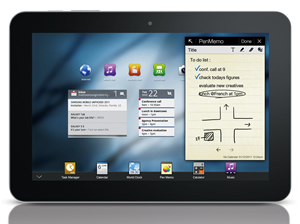 The basics of the tablet are an 8.9-inch multitouch screen that features 800×1200 pixels. The processor running the show is an NVIDIA Tegra 2 CPU clocked at 1GHz. 1GB of RAM comes standard and as usual we have Android Honeycomb 3.0 running the show. Moving along, we have connectivity features of Bluetooth 3.0 on all models,, a 3.15MP rear facing camera with LED flash and 720p video as well as a 2MP front facing camera for video conferencing. The 3G model comes with A-GPS, HSDPA,HSUPA and WiFi hotspot. Even though the Galaxy Tab 8.9 is packing a smaller screen, the resolution is the same as it’s bigger brother which means the pixels are more dense and thus better clarity. The screen overall is very responsive and thanks to the Gorilla Glass coating, scratching the screen is easier said than done. The 1GHz processor is dual-core, as mentioned before and this translates into faster processing. Also, thanks to the dedicated ULP GeForce GPU, things are a lot faster game wise and other tasks that involve excessive graphics. We were a bit disappointed with the camera, but so far that has been the case with every tablet we have revived so far, even the mighty iPad 2. While the front facing camera is great for video calls and the likes, trying to use the rear facing camera as a primary camera is frustrating in the least due to the size of the tablet and the cheap module called a tablet. Moving along, we were surprised with the performance of the battery. Samsung claims around 9 hours of charge and during our tests we came pretty close to the 8 hour mark with moderate web browsing, video watching and game playing. Needless to say, if you use the tablet moderately, you can easily get through a day without needing to find a charger, which is a huge incentive to find out where to buy Samsung Galaxy Tab 8.9″ device. While we won’t spend much time talking about the operating system, we will discuss shortly what Samsung has done in terms of customizations. Just like the Galaxy line of smartphones, TouchWiz will be on board and with the inclusion of TouchWiz comes some nice features such as resizing widgets. Overall, we’re not indifferent to the idea of TouchWiz and we can honestly say the implementation is a lot more tasteful then what we have come to find on the Galaxy S smartphones. Lastly, the 3G versions of the tablet will only work on GSM networks as indicated by the specs. Overall, 3G performance will depend on how well the network is but using the device on AT&T networks returned nice results and thanks to HSDPA, we got download speeds of 7 and 8 Mbps. That is about as fast as the average home DSL or Cable connection. The question will ultimately be whether you need the Tab or not. Personally, we rather the 8.9-inch screen size over that of it’s bigger 10-inch brother. If you want one of the best performing tablets available, the 8.9-inch Galaxy Tab is perfect for those looking for something a bit smaller. However, if you need something bigger, you can always choose the 10-inch. If we had to give it score, a solid 5 stars would be our final verdict. You’ll find one click access to the best option for where to purchase the Samsung Galaxy Tab 8.9″.